An apple a day keeps the doctor away, goes the saying. But is there any truth to this claim? And how can apples help you with your health? 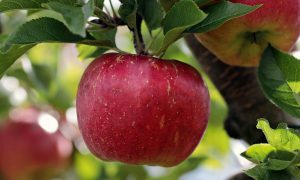 Here are 5 serious heath benefits of apples that you don’t want to miss out on. Apples also have high amounts of anthocyanins, polypehnols. These compounds along with the phytochemicals have been shown to play a role in fighting asthma, type 2 diabetes, cardiovascular diseases, and lung and colon cancer. Yeah, this sounds a bit unappetizing. But saliva is actually really good for you. It can lower the amount of bacteria you have in your mouth and reduce tooth decay. Parkinson’s disease happens when the brain dopamine-producing nerve cells cease to function. High-fiber foods, like apples, appear to protect against the disease due to their antioxidants, which fight free radicals. As mentioned, apples are apparently good for your heart too. A study showed that eating 1 apple a day for 4 weeks led to significantly lower levels of oxidized LDL cholesterol. This was also connected to less risk of atherosclerosis. So whether you’d like to help fight diseases, strengthen your teeth, or improve your vision, apples may be part of the solution. Do you eat an apple everyday?